Your Black Bear Hunt Tale starts 6 hours north of Grand Prairie, in the remote WMU 536 area of Rainbow Lake. This area hasn’t been hunted for over 7 years; previous years producing MONSTER Black and Coloured Bears, which have never seen humans before, our biggest measuring 8’ 1”. We take great pride and measures, to make sure our stand and bait areas are spread out 3 miles apart, so the bears aren’t tempted to travel between baits. 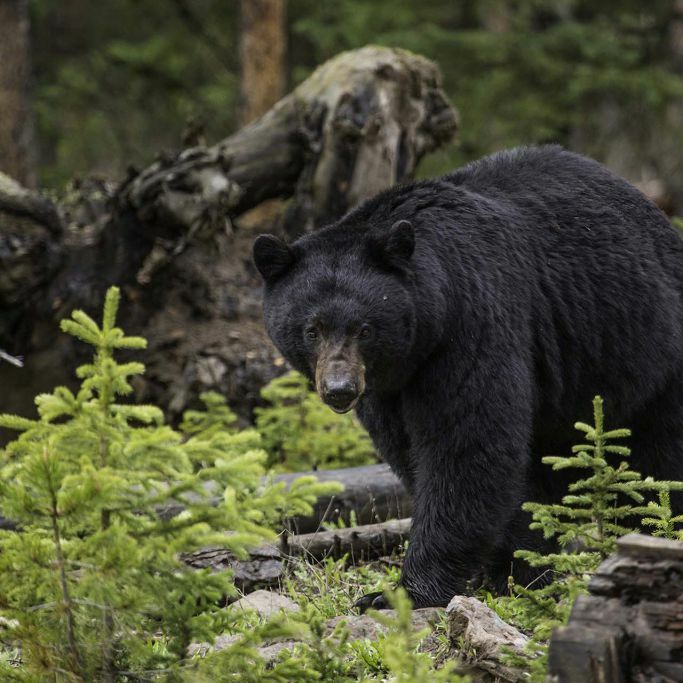 In the past, many hunters have harvested or had the opportunity to harvest, both their bears on the first day and some even walking into the bait. There is no shortage of excitement or opportunity, with frequent visit from wolves, we include the Wolf Hunt, Wolf tag required. (Trophy Fee Applies) Our hunts are held in Spike Tent camps, while using Argo’s to travel out to the stands and bait areas. Adding to the whole experience of making the most memorable Hunting TALE, in the remote back woods of Alberta, Canada. Our fall hunts offer a great opportunity to make your Hunting TALE complete. Book a combo Bear/ Moose or Bear/ Mule a Deer Hunt with equal opportunity at MONSTER in the area, there is no other experience like hunting a Moose in the Rut, or putting a Spot and Stalk on a Mule Deer. Spring Bear Hunt dates are in held in May and Fall Bear Hunts are August/October, with both seasons offered in Archery or Rifle.